On a reasonable level, one would think that the simplicity of this message would resonate clearly with all Christians — divisions and disunity would just evaporate. Yet, this was neither the case in Apostolic Times nor is it the case in the present. Over the last thirty years, there has emerged a tension and a resulting estrangement between “charismatic theology” and “academic theology”. The former emerging from within the monastic circles of piety and the latter emanating from the universities and seminaries. Occasionally, we have seen the adherents of both come to loud discord and sadly in some circumstances ecclesial schisms. In both circumstances, either of these two positions carried to their extremes are not within the historic Apostolic Tradition. The very Tradition to which both sides seek to defend as “Orthodox” is found in a balanced expression that is present within both the charismatic and the academic represented in their fullness and harmony. Here we see how the great leaders of the first century Church and the fourth century Church were often at odds on matters of faith expression and ethical conduct. In spite of these divergences, the unity of faith found in the Person of Jesus was never questioned by these saints of God. We do not worship a creed, doctrine, church, book, philosophy or theology. This is the basic error of the both the “charismatic” and “academic” extremists. To say that one follows exclusively an ascetic no matter how pious is wrong. To say that one follows exclusively a professor no matter how erudite is equally as wrong. We worship a Person — Jesus Christ. For it is in the Person of Jesus, the Divine Logos, that we are introduced to and commune with the Holy Trinity. The need today for authentic Orthodox Christianity to be expressed is for one to espouse an ethos of holiness while maintaining a mindset (in Greek, phronema) of intellectual understanding. Orthodox Christianity is best expressed in its fullness when the monastic (charismatic) spirituality guides the ethos of the heart and the academic (intellectual) theology guides the head. Without this balance, it has become increasingly clear that the Church today will not find itself true to Her Apostolic calling and will be relegated to increasing irrelevance and marginalization in the greater culture. St. Symeon the New Theologian understood this balance in the 11th century. Symeon was an erudite theologian who taught that theology of the head without theology of the heart was empty. The Holy Spirit within the life of the Christian as well as the theologian was crucial to authentic spiritual life.6 It was this emphasis which brought him into conflict with the Church hierarchy, namely the chief theologian of the Byzantine emperor’s court, Metropolitan Stephanos of Nicomedia.7 This conflict came at a time when such discourse was seen as revolutionary and explosive in the Church. The Church was facing deep secularizing influences during that time similar to what the Church is facing today. Even in the world’s eyes, a great injustice suffered by St. Symeon at the hands of his enemies in the Church, was ultimately his greatest opportunity for witness. For it was through Symeon’s emphasis on the spiritual experience of the Holy Spirit that a great “spiritual awakening” and renewal would take place on Mt. Athos and throughout the Byzantine Empire.11 This witness of the charismatic and the scholastic synthesis of St. Symeon the New Theologian continues to this day. As we are faced with today’s challenges and permutations, we should consider St. Symeon’s balance between the charismatic and the academic as solutions to today’s problems. When Holy Scripture says, ‘man is saved by faith alone’ (Ephesians 2:8), it does not mean that he is saved merely by acceptance. There is, however, another kind of faith, the faith of the heart. It is referred to in this way because this kind of faith is not found in the human reason or intellect, but in the region of the heart. This faith of the heart is a gift of God that you will not receive unless God decides to grant it. It is also called ‘inner faith’…Inner Faith is rooted in an experience of grace…Inner faith is noetic prayer. When someone has noetic prayer in his heart, which means the prayer of the Holy Spirit in his heart, then he has inner faith. What Romanides says beautifully epitomizes the proper and healthy solution to the dilemma of the “Fundamentalist” and academic debate. At once, it is all diminished as a straw-man argument within the context of Orthodoxy. In Orthodox Tradition, there is only that what has been handed down from the Apostles. To be sure, in 2,000 years, there have been arguments, schisms, developments, changes in practice, but what remains the same is: One Lord, One Faith, One Baptism.13 That is what remains. That is all that matters. That is what we should be vigilant to call to mind. No monastic, professor, hierarch, clergy or layman alone has the corner on Truth. Christ can reveal Himself to the humblest of uneducated fishermen such as the Apostles Peter, James and John. Christ can also reveal Himself to the most well-educated scholars such as Sts. John Chrysostom and Basil the Great. The same Jesus is Lord of all. Who are we to think that we can create such artificial dichotomies such as we have? The reality is that the charismatic needs the academic and the academic needs the charismatic. The two are not mutually exclusive, but rather they are complementary and symbiotic. As the fourth century Desert Father and theologian Evagoras Pontikos would sum this up perfectly when he wrote, “A theologian is one who truly prays and one who prays is a true theologian.” 14 A rejection of this balance and a continued acceptance of the extremes one way or the other would seem to posit a de facto apostasy from the One Holy Catholic and Apostolic Church. It is crucial today more than ever that the 21st century Church seeks this balance in the monastery, parish, university, seminary, and most importantly in the home. It is not an option, but rather a matter of spiritual stewardship. Most appropriately, it is only His love, mercy and grace which can give us the strength for the difficult tasks which await us on the journey ahead. McGuckin, John (2001) Saint Gregory of Nazianzus: An Intellectual Biography, Crestwood, NY: St. Vladimir’s Seminary Press. deCatanzaro, C.J. ; Malony S.J., George (1980). Symeon the New Theologian: The Discourses Paulist Press, p. 2. Krivocheine, Basil; Gythiel, Anthony P. (1986). In the Light of Christ: Saint Symeon the New Theologian (949-1022). St. Vladimir’s Seminary Press, pp. 44-45. Turner, H.J.M. (2009). 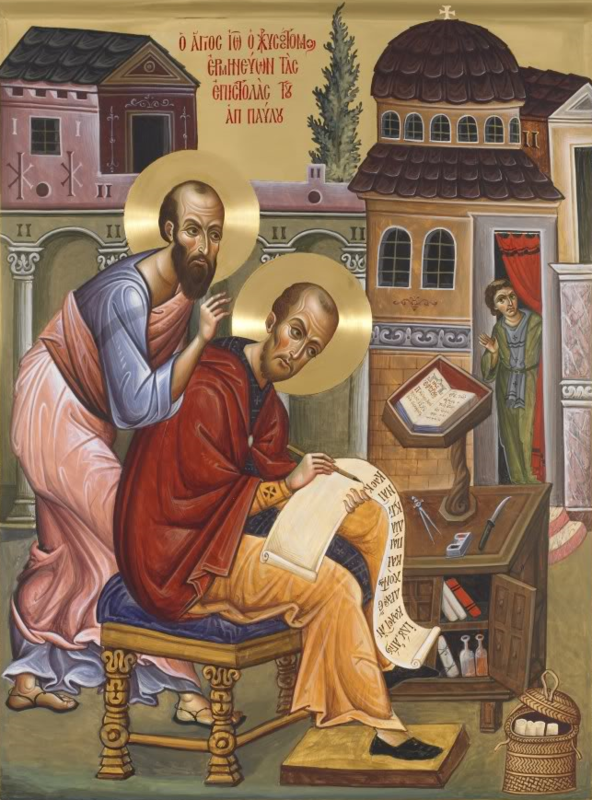 The Epistles of St. Symeon the New Theologian. Oxford University Press, pp. 53-54. Whitacre, Rodney A. (2007). A Patristic Greek Reader. Hendrickson Publishers, p. 188; Krivocheine (1986), p. 53. Romanides, John S., Patristic Theology: The University Lectures of Father John Romanides. Thessaloniki, Greece: Parakatatheke Publications (2004) and Uncut Mountain Press (2008), pp. 92-4. John G. Panagiotou is a graduate of St. Vladimir’s Orthodox Theological Seminary and Wheeling Jesuit University. He can be reached at johnpan777@gmail.com. This is Fr. John at his very best. His understanding of the Gospel as originally written in Greek is so helpful. One must understand and interpret the Gospels in the language in which they were written. We are in the season of The Great Fast. Unfortunately, the English translations of that key word metanoeite say Repent — the Greek really says “Advance your thinking” or “Think next” or “Think forward” Repent says think back — Jesus says think ahead or think anew for the Kingdom of heaven is nigh. Fr.John, write more — you are good. Tom Acker, S.J. Very well said, Father John! Thank you for posting. It’s disappointing to me that someone as learned as Fr. John apparently is trots out the old canard that the Apostles Peter and Paul “argued bitterly” over issues of adherence to the Mosaic Law in the early Christian community. If this is taken to mean that they were genuinely at odds over what they believed the Holy Spirit was leading the Church to do in the question of whether or how Gentiles were to be incorporated into the Church, this is not supported by Acts 15, nor it seems to me even by Paul’s report of his confrontation of Peter at one point with Peter’s hypocrisy resulting from his fear of the circumcision party (Galatians 2). Considering God’s revelation that the Gentiles were to inherit the Kingdom through Christ apart from the Law as well as the Jews was given initially to Peter, not Paul, (Acts 10) and that Peter was among those who gave the right hand of fellowship to Paul to go as an apostle to the Gentiles and didn’t even compel Paul’s Greek disciple, Titus, to be circumcised, the issue does not appear to be a real difference of opinion between Peter and Paul, but rather Peter’s capitulation out of fear to “judaizing” Christians (“false brethren”) in a moment of weakness (Galatians 2:9). It seems to me the fact that Peter was considered a “pillar” in the early Church plus the fact that he capitulated for a time out of fear to the judaizers leads some to conflate these two facts to infer Peter was leading the judaizing efforts contra Paul in the early Church. I believe that notion is false. I agree, Karen. I thought to myself that this person, himself an academic, has not moved beyond his own perspective in order really to obtain balance. What fathers does he cite for this “bitter disagreement”? The monastic must of course be educated and be within the canonical and dogmatic sphere of the faith– but if the saints are any indication, the monastery is the real place to learn the theology of the Church. Scholarship is good but it is quite often subject to academic fads, egoism, and the scourge of what Fr. Seraphim (Rose) called, “theology on a full stomach.” Such theology, as best represented by SVS and their parent, St. Serge in Paris, is shallow, disconnected, and ultimately borrows an unbelieving, skeptical hermeneutic from the world. “Ignorant monks” can certainly be a problem. Much more of a problem, however, in our day, are the pseudo-intellectual academics who have drunk deeply from unbelieving Western sources and methodology. A string of letters at the end of ones name does not, at the end of the day, mean that these people have mastered the teachings of the holy fathers. More often, they have mastered how not to take them seriously, as though they too had been academics and not those whose eyes saw into spiritual realities. This kind of self-congratulatory “conference Orthodoxy” is hollow and pathetic compared to the witness of the holy monastics, or even just simple priests who actually love to pray, rather than engage in a bunch of idle talk. America is and probably always will be the cultural backwaters of Orthodoxy. Nothing serious comes from us. Russia, Greece, Romania, Serbia– these are the fountains from whence there have been marriages between great scholarly learning and deep interior piety. Such luminaries as St. Justin of Chelije (who nearly obtained his doctorate from Oxford), Blessed Fr. Mikhail Pomazansky (who obtained degrees from the great theological academies of pre-revolutionary Russia), and Blessed Met. Antony Khrapovitsky, a great scholar and a profound confessor of the faith and a reformer of Russian theology to wean it from dependence upon Western vocabulary, and even in our own day: the great Archimandrite Irenai (Steenberg) and Fr. Josiah (Trenham), these are the scholars to whom we ought to listen, not Paris-school modernism, warmed over from the 70s. Such theology, as best represented by SVS and their parent, St. Serge in Paris, is shallow, disconnected, and ultimately borrows an unbelieving, skeptical hermeneutic from the world. I hear what you are saying. I have wondered out loud at some of the “scholars” of the english speaking Orthodox world, and in particular at the Paris/Oxford/(too a lessor extant) SVS axis that appears to currently have Bishop Kallistos as the spine. Why the slovenly devotion to “Climate Panic”? Why the willingness to entertain the “ecclesiastical archaeology” of women’s ordination when the Faithful are so very confused by the secular cultures definitions of anthropology and “rights”? What about the pushing of “theology” that just happens to line up a little too easily with left wing/progressive politics, such as the Orthodox Pacifist Fellowship (I know, I renamed it 😉 )? This kind of self-congratulatory “conference Orthodoxy” is hollow and pathetic compared to the witness of the holy monastics, or even just simple priests who actually love to pray, rather than engage in a bunch of idle talk. Bishop Kallistos is of course there, along with the very important “juried competition of research posters.”… 🙂 Does something like this actually have any influence at all on the coming Great Council? I have to admit I hope it does not. It appears to be another gathering of “progressive” Orthodox talking amongst themselves. these are the scholars to whom we ought to listen, not Paris-school modernism, warmed over from the 70s.